T.H.R member Stephen Brayshaw kindly let's us see some of his on boat footage and some off the boat (on it's side) of the A Class European's last month. Enjoy. By the way nice hat bloke! Plus here's a couple of happy snaps. 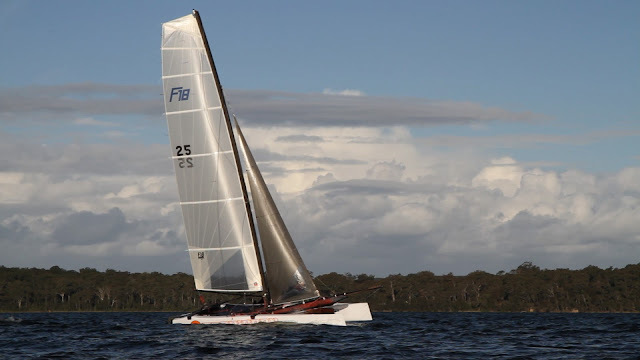 Here's an couple of great videos of the C Class Catamarans sailing. This next LAC is going to be extremely cool and I'm going to be doing everything I can to get there and be part of it. You never know maybe even a Aussie entry (or two)? The first video is from Magnus Clarke and shows a nice little pitchpole at the end. Next video is from the boys at SA and the highlight reel from Newport RI. A huge thanks to them for being there and filming it all as I spent every night glued to my computer screen watching the footage. Nothing to do with multihulls but hey I love these two videos from Team PUMA in the VOR.Sit back watch, laugh and enjoy. Like they say at the end, PUMA 'your new favorite team'. Mind you they were my favorite team to start with. Annie Gardner and Eric Witte showing the Oracle boys how it is done! Photo from Carol Vernon. Saturday started off with a light Northwest wind making life very difficult for the volunteer race committee. 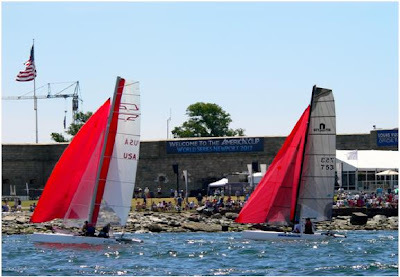 Keeping with the spirit of the demonstration event, a course was set parallel to the Ft. Adams shore, making for some high intensity reaching starts and a blasting spinnaker reach in front of the spectators. As the morning progressed the legendary Newport seabreeze began to fill, creating chamber-of-commerce hull flying conditions for the sailors and spectators alike. 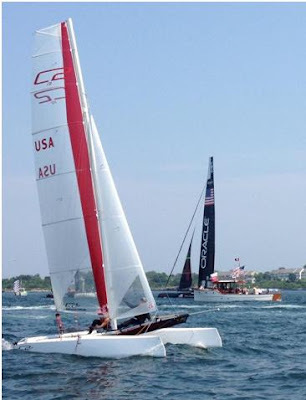 After six races, and with floating billboards making their way onto the course, racing was called for the day and crews joined the thousands of spectators watching the AC45 racing. Sam Adelman and Chris Titcomb reveling in the famous Newport seabreeze. Photo from Lindsay Smith. Sunday morning started light, but the seabreeze began to fill early, allowing for six more races to be completed in a growing southerly. The races were challenging, with extremely short courses placing a huge emphasis on starting and managing the corners of the course. Just as the AC45s experienced during their racing, the current played a tremendous role in decision making, and choosing how far to push into the shore on a short windward leg was a critical moment. As the breeze built on Sunday, the top boats were completing each two-lap race in just under ten minutes, pushing crews to the limit! Overall, the weekend was an event few of us will soon forget. Six races were completed each day, with an average length of fifteen minutes. With the leeward mark mere yards from the shore, the sounds of screaming fans accompanied every rounding and spinnaker douse. Packing up the boats after racing, I received incredible feedback from people who arrived early for the AC events and enjoyed watching us racing. 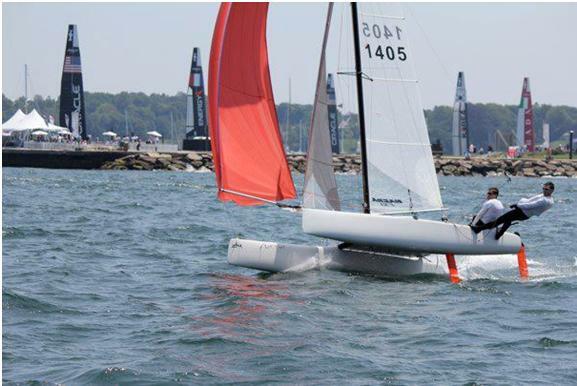 While multihull sailing might not be for everyone, I hope we showed that the F18 Class is THE place to be for performance small boat sailing on the US East Coast. Last, I want to thank everyone who made our event possible. Sail Newport and Jamestown Boat Yard were incredibly accommodating, allowing us to launch on one of the biggest weekends Newport has seen. The Fort Adams Sailing Team loaned the fleet a RIB and marks for race committee, and I cannot thank them enough. Finally, the biggest thanks goes to the RC of Kerry Sullivan, Stephen Reed, and my lovely wife Lianne for running twelve great races in challenging conditions amidst a spectator fleet that grew into the hundreds. See you all in LA! 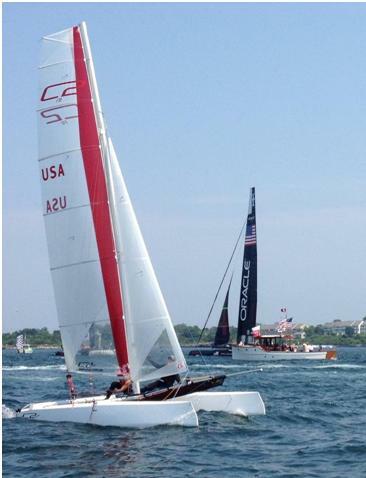 Sailing for the ACWS Demonstration event took place immediately off the America's Cup Village at Ft. Adams. Photo by Stephen Reed. Arno @ DNA has been doing some development with masts which I thought I would share. What it does say is Stevie is right on needing to use every mast design so he can design sails around the mast rather then the old if you have this mast brand mast you need this brand sail. Doing this you will be able to order a sail that will already be matched to your brand mast. 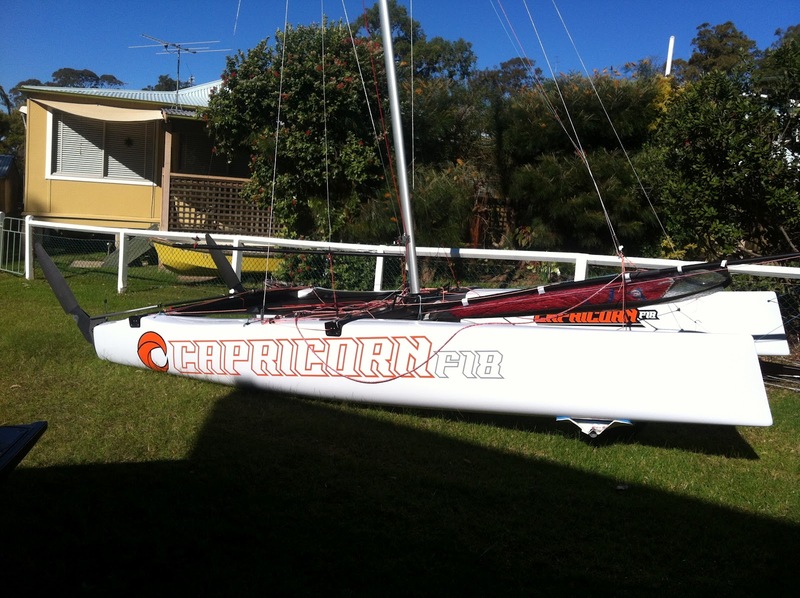 We will officially introduce our mast at the Europeans. We have tested the mast for two years now and are happy now both with the performance, the looks and its strenght. The whole idea was to make a mast which was both faster and stronger than the existing masts as we felt that the mast was the weakest part in the pakage. 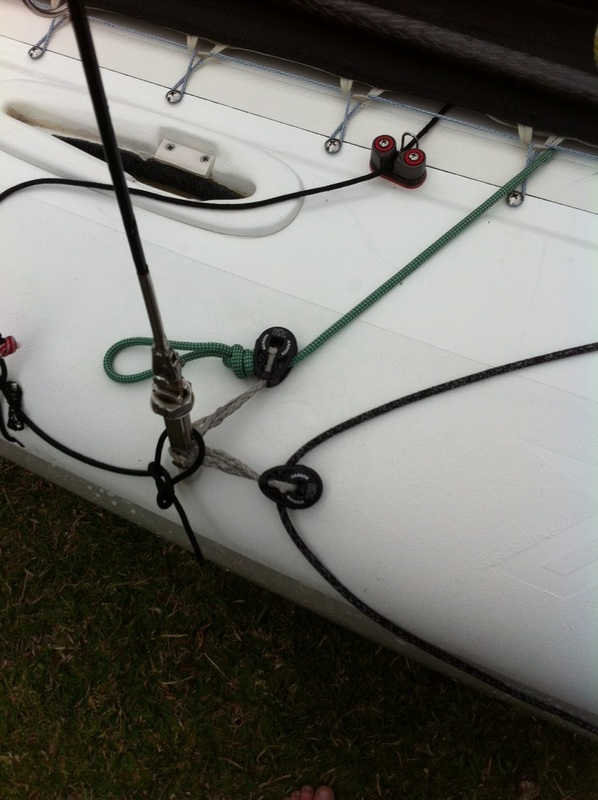 Mast breakages are not good for the class and with trapezing downwind you have more hard crashes. We choose to make a tapered mast which is slightly wider in the bottom and smaller and thinner in the top. The profile in the bottom is slight rounder and becomes flatter in the top. 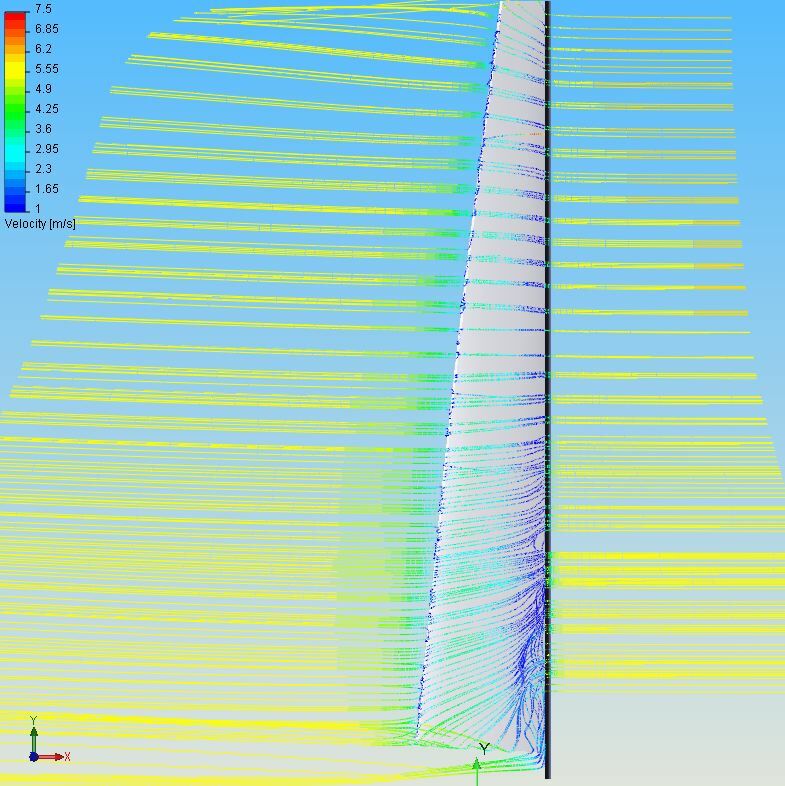 The difference in profile between bottom and top accomdates to the difference in windsheer at boom and top level. 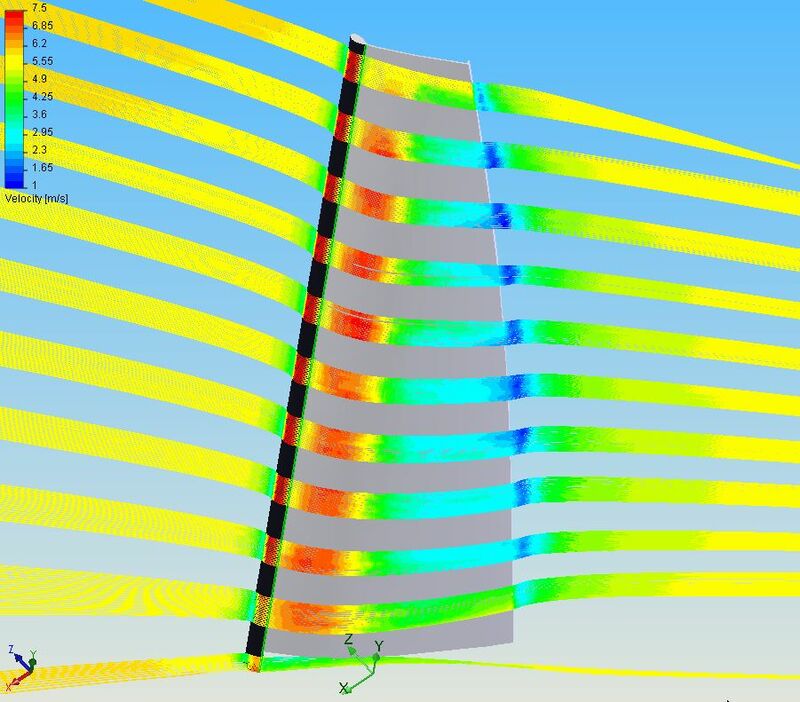 There is a built in windsheer compensation as the exit in the top is flatter than in the bottom. 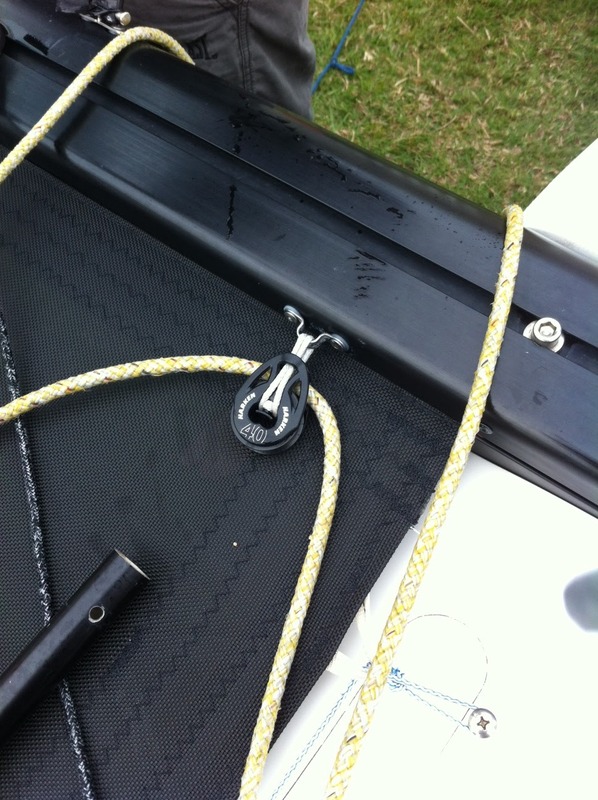 As the mast becomes thinner in the top we have to use more high modulus in the top to make it as stiff as needed. This makes the mast slightly heavier (200 grams). The mast is a bit more expensive as we have to use more high modulus carbon fiber and because the mast is made in a more expensive mould. The membrane sails of Glenn and Landy are the newest trend. These sail hold their shape very well and are clearly faster downwind than most other sails. The sails are significantly lighter. We still have to see how durable the sails are though. Another trend is the return of the positive roach on the sails of both Glenn and Stevie. The consequence is slightly smaller heads (in the case of Stevie), but better control of the overall shape with your mainsheet. The membrane sails are fast downwind because the leech is stiffer than most other sails. The Maxx sails are relative soft in the leech which leads to fast sails upwind but makes it harder to use downwind as you easily pull too hard on yoour mainsheet. 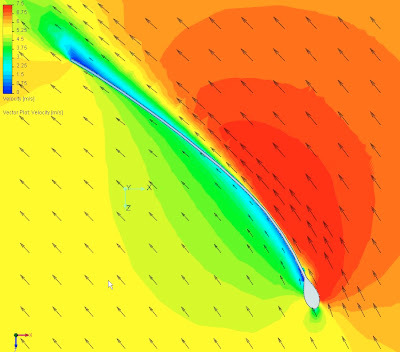 It is not that the Maxx sails are exactly slow downwind, but certainly harder to use. The Stratis sail of Glenn is very hard to trim upwind as it is more sensitive to mastrotation and cunningham than the sailsof last year. We do see higheer endspeeds though. The membrane of Landy is claimed to be easier to use and is in essence a second generation membrance sail. I have not used it myself so I cannot comment on its performance. Stevie has switched to radial sails which seem to be very fast downwind. Center of effort is pretty high up as he uses a high clew and the sail is relatively wide at the hounds. 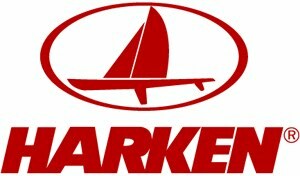 The radial sail is also stiffer in the leech than last year's Maxx and might therefore suit heavier sailors better. Micky made a very nice Maxx Pentex sail for Chris Field with which he did very well at both the German and the French Championships. Although he uses pretty soft cloth he aligned enough fibers along the leech to have a good downwind performance. 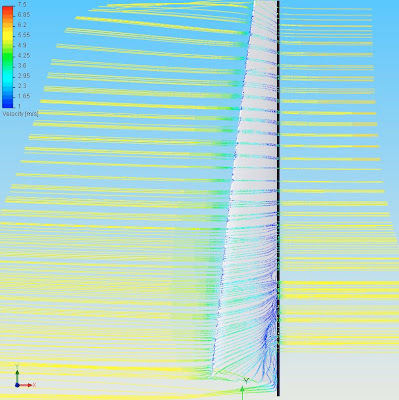 My conclusion is that it makes sense to use stiffer sails on softer masts. This can also be accomplished with traditional sailcoth by changing fiberorienations and/or by using other fibers. Another prediction: The difference between rigs for the ligher and heavier sailors will become smaller! Adding more luffcurve for the heavier sailors does not make always sense as it can hurt their endspeeds. If the lighter sailors still can flatten the fuller sails on their masts, they will use the fuller sails as well. 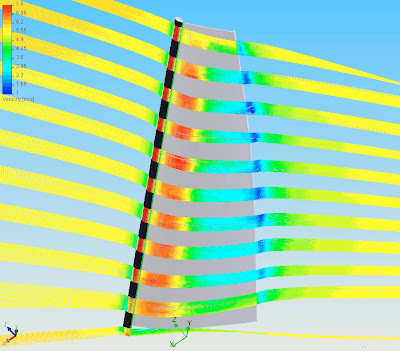 Last two seasons the lighter sailors were way faster downwind, I do think that this will be no longer be the case as the sailors will get more power out the sails downwind and the higher righting moment leads to higher speeds. The longer daggerboards do help the heavier sailors as well as it seems to be easier to keep the boat on its boards especially in rough conditions with waves or big swell. Up here in Darwin we are having very unseasonal strong south/south-east winds with the possibility of not sailing today. The invitation race on Saturday was held in 6-8 knots of breeze. Sunday the first two heats were sailed in 10-12 knots and yesterday the wind started at about 18 knots and faded to about 15. Chris (Bundy) Batenburg has been flying on his DNA and won every heat so far. Yesterday he really pushed downhill and lead by a 300-400 metres over Chris Parker, John Dowling and Michael Kopp. Results and photos available at http://manta.org.au/index.php/a-class-regatta-overall. Of course the weather has been magnificent and the beer flowing freely. Sorry a little late but better late then never. First, let's talk about the location: Lake Garda, Arco and CVA proved to be an excellent place to organize the Euro. The wind conditions were excellent, hence the planned program could almost be followed to the letter. 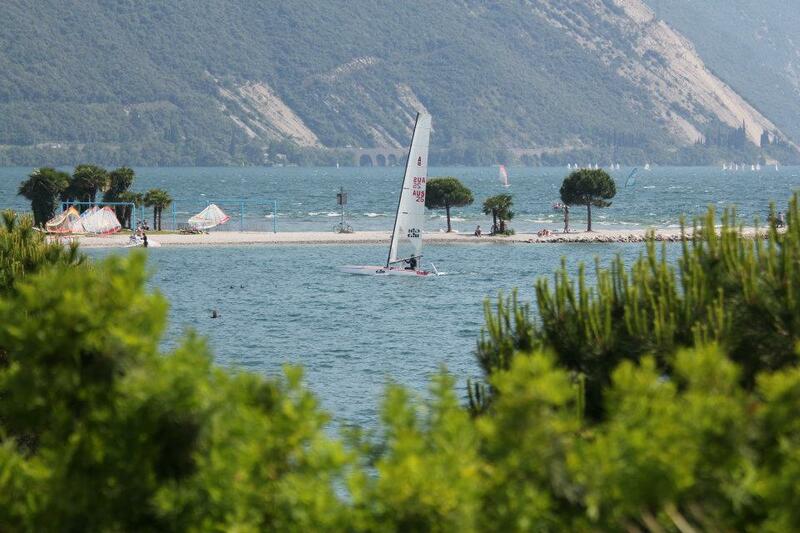 With winds in the 10-22 knots range and waves, Lake Garda is certainly a challenging location, but as well an exciting playing field for sailors of all levels. Then, looking at the CVA club: the measurement certificate checks at the beginning of the week was perfectly organized, and the watering of 100 boats within one hour is certainly not an easy task, but it was well organized by the club and worked as expected. On the water, the race committee did a very good job with the start line and buoys placement, and the sailor had no wait time between the races. Roberto Vuilleumier did an amazing job at picturing the event. Back on shore, every hungry sailor found excellent Italian food. Now looking at the sailors and their hardware: the top sailors at this event were on several different designs. In the top-5 list, one can find 4 distinct combinations of platforms, masts, sails. 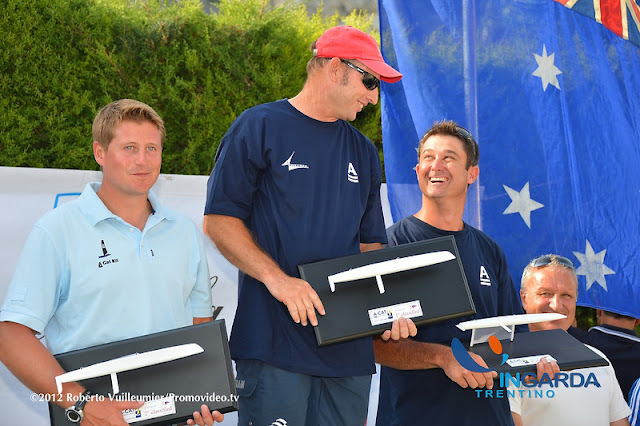 Exactly 10 years after Peter Tobler won the 2002 Europeans in Marseille on a yellow Scheurer, Landenberger was again successfull on a "G6" boat from the Swiss shipyard of Andy Scheurer. DNA, Vision and Nikita are equally well represented on the starting line, and no single platform showed a clear weakness. This shall once again show how our class is in excellent health, with many good sailors joining us from other classes. The development of vibrant designs, new masts, new sails, wingsails, appendices and new hulls is a tribute to our success. Every nation is well represented on the ranking list, but the Australians are clearly the leaders. Only Chris Field could break their dominance with his 2nd rank. Scott Anderson had won the world title in this exact place in 1986, and is now 4th overall, while being Great Grand Master. This is a true achievement and we wish Scott a lot more years in sailing ! The European Championship was until now never fought so hardly, which is once again a sign of excellent health for the class. 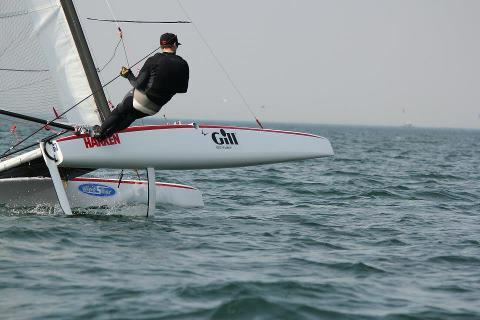 On the sailing technique front, it now appears that trapezing downwind is the only way to keep up with the top of the fleet. 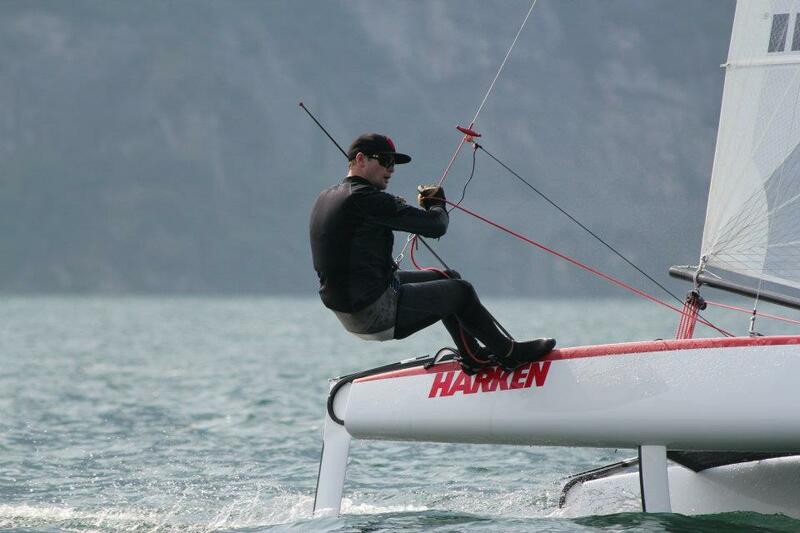 The best sailors are mastering this new way of going down faster. When the boat sinks, the figures can be spectacular, but no one has been seriously hurt so far. It is now time to thank the organizers: Carlo Pompili president of the CVA, his office with Laura, Antonella, Sylvia, Tristano, and all the people on the water and shore who ensured a successful championships. On the SACA side, we had Yves, Franco and Dominik working behind the scene until everything was polished and nailed. 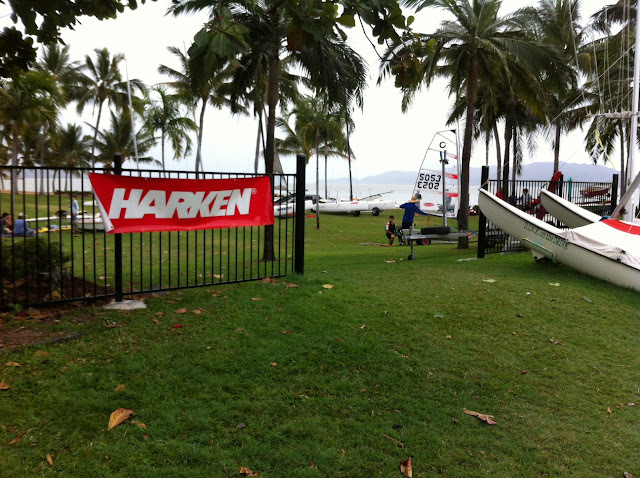 Thanks again to all who helped and participed, we wish you fair winds for your next races ! All the news, results, videos, pictures and interviews will be available on the event website: www.acateuro2012.ch. Chris from PSA has been out on the water testing the new Capricorn 3 and sent though a few photos and a great little video. The boat now has all the bugs out of it and showing some promise so it will be great to see it out on the water at the start of the season in October. 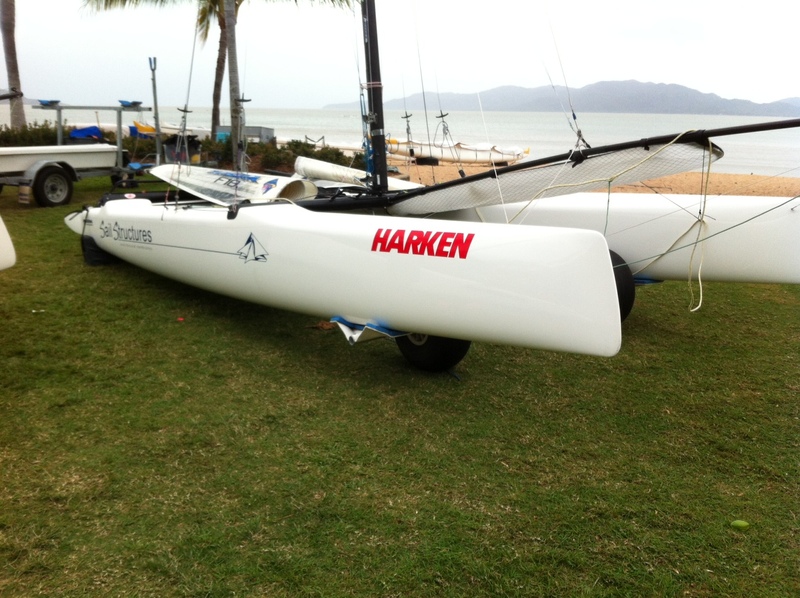 They have been testing different rigs (AHPC & Nacra) and came up with a way of the platform being able to take any rig combo. Go here to see the video and the boat in action. The factory currently has 3 more boats getting built at the moment for the start of the season and will be out in force on the race track.